Several winter squash varieties with resistance to powdery mildew (PMR) have been commercialized recently, providing growers with a valuable additional tool for managing this important disease. These will be especially useful considering some NY growers have stated they feel this disease has increased in importance, which likely is at least partly due to impact of fungicide resistance on efficacy of chemical control. When this disease is not managed, plants are more susceptible to gummy stem blight/black rot, and leaves die before fruit mature, consequently fruit have low sugar content and consequently poor flavor, and they do not store well. Powdery mildew occurs every year, typically first appearing at the start of fruit production. It cannot be avoided due to the large number of acres planted to cucurbit crops, the ease with which the pathogen spores are dispersed by wind, and the wide range of conditions favorable for disease development. Application of fungicides is presently the principal practice for managing powdery mildew in squash. Now that resistance has developed to the QoI (aka strobilurin, FRAC group 11) fungicides (Amistar, Quadris, Cabrio, and Flint) in New York, as well as elsewhere in the US, managing powdery mildew with fungicides will be more challenging and also more expensive as growers will need to use additional fungicides. The cucurbit powdery mildew fungus has also developed resistance to MBC fungicides (aka benzimidazoles; Topsin M and Benlate) and DMI fungicides (Nova and Procure). Additionally, there is a heightened interest from consumers today for food grown with minimal pesticide inputs. Thus the demand for PMR varieties is likely to increase. PMR varieties evaluated previously exhibited a range in level of resistance that partly reflected whether the variety had resistance from one or both parents. There may also be minor genes for resistance accounting for some of the variation in reaction among PMR varieties. None of these varieties are immune to powdery mildew. With some, powdery mildew is suppressed early in its development, but by the end of the growing season these PMR varieties become as severely infected as varieties lacking genes for resistance. Thus PMR varieties need to be evaluated. Growers cannot assume they will all exhibit a similar level of suppression of powdery mildew. In another study, percent control achieved with PMR pumpkins relative to standard susceptible varieties ranged from 0% to 100% (eg no control to complete control)! 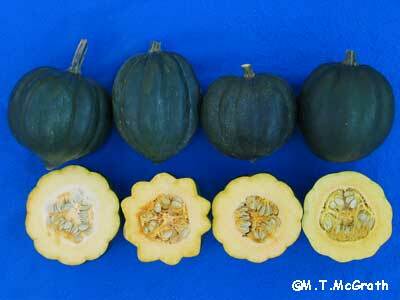 The 3 green acorn squash varieties evaluated in 2005 on Long Island exhibited similar, good resistance to powdery mildew. They were Royal Acorn PM (Harris Moran Seed Company), Sweet REBA (Cornell University Plant Breeding Program), and NH bush acorn (University of New Hampshire Plant Breeding Program). All three have a resistance gene from both parents. They were compared to Table Ace (Harris Moran), a standard acorn squash variety lacking known genes for resistance to powdery mildew. NH bush acorn produced significantly smaller fruit and less fruit by weight per plant than the others, but the fruit had substantially higher sucrose (aka sugar) levels. Fruit from the other varieties did not differ significantly in sucrose level. There were no significant differences among varieties in number of fruit per plant, width of fruit, or width of fruit cavity. In a previous experiment conducted in 2002, excellent suppression of powdery mildew was achieved with the PMR green acorn variety Autumn Delight, which was not improved significantly by spraying it with fungicides; but its fruit had sucrose levels numerically lower (but not significantly lower) than other green acorn types. In that experiment Harlequin, green striped acorn, exhibited similar mildew suppression and its fruit had significantly higher sucrose levels than all the dark green acorns evaluated. Both Autumn Delight and Harlequin have genes for resistance from both parents. In another experiment conducted in 2002, Bugle, a butternut type, exhibited excellent suppression and high sucrose levels based on taste. These varieties provided better control of powdery mildew than that obtained with fungicides applied to standard susceptible varieties. An integrated program, consisting of a reduced fungicide program applied to a PMR variety, is recommended for managing powdery mildew in winter squash to ensure good control and to minimize chance of selection of pathogen races/strains able to overcome the genetic resistance in the plant or the action of fungicides. Fewer fungicide applications are needed with a PMR variety because powdery mildew often starts to develop later in PMR than susceptible varieties and the spray interval can be increased from 7 to 14 days without affecting control. Routine scouting is needed when growing PMR varieties not only to determine when powdery mildew has started to develop, and thus fungicide treatment is warranted, but also to detect other diseases. Some fungicides used for powdery mildew on susceptible varieties have broad-spectrum activity and thus will control additional diseases that may consequently not be detected when growing susceptible varieties.